First off, congrats to both Butler and Duke. An amazing game, well played. Kudos to both you guys. 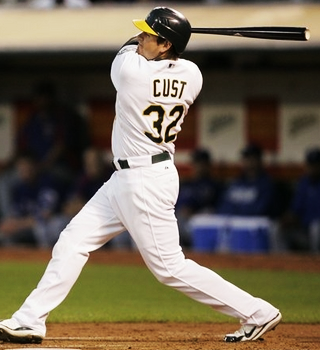 So Jack Cust after being cut from the A's 25-man roster? "I think it's messed up," Cust said in a phone interview with The Chronicle after leaving the stadium. "They're going to go on 50 at-bats after three years of what I've done here? It's ridiculous. A lot of other guys have had bad springs. This is a joke. "The fact is, this team has no power and they've just released a guy who (averaged 28 homers) the last three years. That's amazing." Now, yes, he hits homers. So did Dave Kingman. But Jack, you also batted about your weight the last 3 seasons, and batted .219 in spring with one home run. So why exactly are you so mad that the Athletics are trying something new? Rushthecourt.com had a really interesting experiment, especially now that the NCAA Championships are over. In short, they treated March Madness as if were being run by the college football method. So instead of being upset, Kansas and Kentucky are handed the championship game. Duke is relgated to one of the numerous Bowl games. And Butler doesn't exist at all. Now, doesn't that sound like so much more fun that how it played out? Way to miss the point, professional news writer, Alex Marvez of Foxsports.com. In his article yesterday, he said being traded to the Redskins, in the Eagles own division was a slap in the face. How insulting!!! Umm, yeah, maybe Alex, except Donovan insisted on being traded to the Redskins. Oh, I guess, nevermind. I mean, yeah, sure $15 million a year is nice and all. But to coach the Nets. Hmmmm, pass. 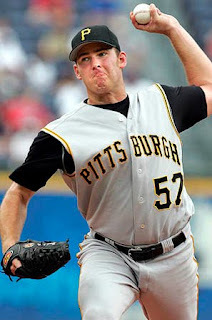 And in saddest news of the week, the Pittsburgh Tribune-Review reports that Zach Duke is the winningest pitcher in the history of PNC Park. At 27-24. Ooooooof. Once again, love the guys at PFW. But couldn't disagree more with their latest mock. First off, they have Ndamukong Suh lasting until the fifth pick. They have the Redskins taking Bryan Buluga instead of the much more mobile Trent Williams (remember guys, Mike Shanahan needs mobile tackles), and he has Tim Tebow going number 24 to the Eagles. Why on earth would they take Tebow in the first round. he could be gotten later? He's not ready to start as a QB, and you have Kevin Kolb in that role anyway. And if you use him as a wildcat, you have "Tebow-Lite" in Michael Vick. Why would the Eagles take him, guys? Yeah, Albert Pujols production seems to be falling off a cliff now that he's 30. And finally, not to rag on the Prez. But really, what the hell was this? Granted, $15 Million is a huge number, but Coach K pulls in millions now, and I can guarantee he'd become quickly frustrated at the players' attitudes in the NBA. Besides, he's back on top of the ACC now, and he has the chance to be the winningest coach in NCAA history.